Have you ever fantasized about the ultimate dog — a corgi and husky mix? If you love chubby little corgis and large beautiful huskies, but don’t have the space or the time for both, then we have news for you. There’s no need to buy two – you can enjoy all that in a single dog! What is a corgi and husky mix known as? A horgie, and while it may seem like an unlikely pairing, the results are absolutely brilliant and devastatingly cute. 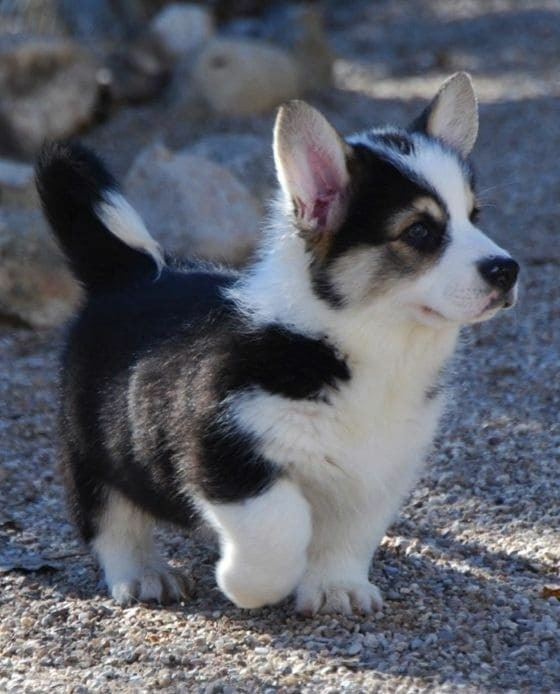 Think the long body of a precious corgi puppy, along with the black-and-white features of the traditional husky. But as with any animal, there comes a serious amount of commitment and dedication with taking care of any new addition to your family, especially one that’s an unusual result of specialized breeding. This basic guide will provide you things you should know before welcoming a sweet, loving corgi-husky puppy into your family! Corgis were originally used as cattle-herding dogs for farmers found in Pembrokeshire, Wales. Today, the corgi is a dog highly favored by the British royal family, as you may have noticed from the two sweet things running around the Queen’s feet – though they’re not so much preferred by the British commoner as they once used to be. The corgi is ranked on The Intelligence List of dogs at #11, meaning they are very intelligent and astute little pups. According to the American Kennel Club, the corgi is the 20th most popular breed of dog in the world as of 2015. The husky is known to the northern regions of the world where cold and snow dominate. They are and were used to pull loaded sleds through the thick winter snow, which gave them serious muscle mass and energy. They are appropriately built for the cold with their thick coats and incredible endurance for frigid weather. Huskies are also used by many who participate in sled racing, and after they’ve helped their owners win a few medals, those huskies are put into retirement where they make great family pets. They’re especially good with children and are very intelligent, making them both good work dogs and leisure companions. Huskies are also currently the most common breed for cross-breeding with other dogs. This is where mixes like the horgie originate. Where Do Horgies Originate From? The obvious answer is that when a husky and a corgi love each other very much… they produce a beautiful husky corgi mix puppy! But for a more complex answer, the origin of this cross-breed stemmed from people’s desire to have the size of a corgi combined with the stunning physical features and characteristics of a husky. The corgi husky mix is also a very adaptable dog, well able to adjust quite easily to various climates, allowing them to live healthy lives virtually anywhere, in any condition. If you’re looking to travel a great deal and don’t want your pet to be troubled by the weather changes, then this dog can roll with the punches like you do. Horgies can be trained into excellent dogs for families with children, and are also generally quite happy and active morning animals. They are attentive, energetic, and spunky creatures that show a great deal of loyalty and protective qualities to their owners, making them an overall pleasure to have around! The horgie will grow to around 13” tall and generally end up weighing between 20-50 pounds. The average husky corgi mix generally enjoys a long, healthy life of 12-15 years and sometimes longer! Your horgie will have the build of a corgi with a long body and stout little legs. They will normally not stand very tall, but from there up, they’re all husky with brown or black eyes and pointed ears. They generally have grey and white fur and the distinctive markings of the cold-weather animal, although some horgies can have brown in their fur as well. A corgi and husky mix will generally have a tail similar to that of a husky that is long, white, and fluffy. It’s also very adorable to see that long, wagging tail on such a short, comparatively-stubby body! Take a look at this video of a husky corgi mix — they call it a siborgi! The corgi husky mix is most commonly known for back problems and their wide range of weight (20-50 pounds). However, that doesn’t mean that all horgies will have back problems. A healthy lifestyle can really help cut down on these issues, as proper exercise will strengthen them. If you adopt a horgie, you will of course pay an adoption fee at a shelter and, in most cases, that runs between $50-100. The other option is of course buying the dog from a breeder. A qualified, quality breeder will generally charge between $800-900, but in rare cases, horgies coming from a purebred lineage can run up to $1,200. Generally, the costs for a horgie are a little bit higher in the UK, where horgies are considered “royal” dogs with a higher profile than in the rest of the world. So that’s everything you need to know about the corgi and husky mix! Do you want to adopt a horgi? But a horgie is not a recognized breed, so there is no such thing as a purebred “horgie” making it an expensive mixed breed at the $800-1200 range . Is there such thing as a quality breeder of mixed breeds (aka mutts)? It is possible to find a purebred puppy from a reputable, responsible breeder with proven, health tested lines in that same price range, or a little more. As a mixed breed, it’s difficult to know exactly what the dog will be like as an adult (note the wide weight range), which temperament will it end up with. A Husky tends to have high prey drive, while a Corgi is a herding breed … hmm, how is that mix with other pets in the home? I guess PT Barnum was right: There IS a sucker born every minute. People–these are mutts that the puppy producers, certainly nobody would call producers of mutts “breeders,”–are charging money for mutts with the genetic, physical, and mental problems inherent in both breeds. Save your money and put them out of business. However, if it is a mutt you want, and that is perfectly fine, look at adopting from a shelter.